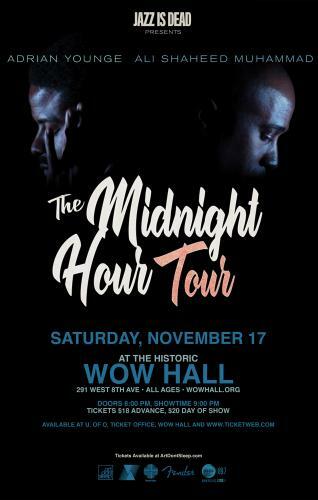 On Saturday, November 17, the Community Center for the Performing Arts proudly welcomes The Midnight Hour to the WOW Hall. When two of hip-hop’s most accomplished composers get together to make an album you know the results are going to be special. Ali Shaheed Muhammad (of A Tribe Called Quest) and Adrian Younge began their work together in 2013 on the critically acclaimed Souls of Mischief album There Is Only Now and their partnership cemented on their score work for Marvel’s Luke Cage. They are touring in support of their carefully constructed and masterful The Midnight Hour. It is the duo’s long awaited debut album and it showcases their songwriting ability like never before. The 20 track, full length double album, released on Linear Labs and distributed digitally by INgrooves (vinyl will be distributed by Traffic Entertainment), was released world wide on June 8. You can listen here <https://themidnighthour.bandcamp.com/> . They also just finished the score and sound track for season two of Marvel’s Luke Cage on Netflix. Lead track and first single “Questions” features vocals by CeeLo Green. Adrian and Ali began working on this album back in 2013, but put the project aside as they would score the hit Netflix series Marvel’s Luke Cage. The Midnight Hour is a soul/jazz/hip-hop album that continues the conversations started by yesterday’s jazz and funk pioneers; those that created the bedrock of samples for hip-hop producers in the 80s/90s. The Midnight Hour is sophisticated hip-hop that fans will enjoy, capturing their jazz rhythm section, and a full orchestra, to analog tape. One of the seminal compositions, “Questions,” originally began as an unfinished Midnight Hour demo with CeeLo Green. However, Kendrick Lamar heard the track and wanted to sample portions of it for his GRAMMY-winning album To Pimp a Butterfly (the song ultimately made it to Kendrick’s 2016 compilation untitled unmastered. as "untitled 06 | 06.30.2014."). The full, completed version of “Questions” is now the lead single on The Midnight Hour and perfectly captures the album’s underlying roots in hip-hop’s origins. “So Amazing” is a re-imagining of Luther Vandross’ 1986 single. Ali and Adrian took Luther's original vocal stems and composed new music, as if Luther was in the room with them. This transcendental recording is something that really makes The Midnight Hour special. The June 8 drop for the album couldn’t have come at a better time. Luke Cage’s Season 2 began on June 22 on Netflix and The Midnight Hour have a lot of special surprises in store for both the original score and the original music that they have created for the show. Tickets are $18 in advance, $20 day of show. Doors open at 8:00 pm and showtime is 9:00. Listen or watch their performance on Morning Becomes Eclectic here <https://www.kcrw.com/latest/the-midnight-hour-live-on-mbe> . See what Pitchfork <https://pitchfork.com/news/a-tribe-called-quests-ali-shaheed-muhammad-and-adrian-younge-announce-album-share-new-song/> , Billboard <https://www.billboard.com/articles/columns/hip-hop/8458937/the-midnight-hour-luther-vandross-so-amazing-premiere> and Consequences of Sound <https://consequenceofsound.net/2018/05/ali-shaheed-muhammad-and-adrian-younges-the-midnight-hour-share-black-beacon-stream/> have had to say about them.